Personal lightning detectors could be a lifesaver for anyone who works in the outdoors, but also for people who spend a lot of time in the outdoors recreationally. To help Americans choose the best personal lightning detector to fit their needs, we have provided an overview of some of the best lightning detectors below. Read on to discover why you should obtain a lightning detector, but also to find out which ones provide you with the best functionality. A personal lightning detector can detect lightning produced by thunderstorms. It is a popular device amongst campers and golfers, but also professionals who work outdoors often; this includes law enforcement officers, sports officials, and many others. To provide you with personal protection against lightning, a lightning detector will detect the electromagnetic pulse (EMP) caused by a lightning strike. The device will measure the strength of that electromagnetic pulse, providing the consumer with an estimated distance for the lightning. Some personal lightning detectors can even take it one step further by calculating the direction of a storm. All these features ensure the consumer can get to safety before the lightning could possibly strike them. Many companies provide personal lightning detectors nowadays, but as you can imagine, some brands provide better products than others. Today, we cover the brands that have delivered the best personal lightning detectors this year. Read on to get more familiar with these brands, and to determine if their personal lightning detectors are the right choice for you. AcuRite is a brand that frequently provides weather-related technology. In addition to their personal lightning detectors, the company also provides weather stations, which can be used to predict extreme weather situations. Consumers who choose AcuRite commonly do so for the affordability of their weather-related technology, but also for the accuracy of the equipment. In our overview of best personalized lightning detectors, you will also find a lightning detector from the AcuRite brand, which is one of our recommended choices this year. SkyScan is one of the world leaders in lightning detection systems; this includes personal lightning detectors, but also professional lightning detectors. Their lightning detectors are commonly used by companies and organizations, which often have employees spending a lot of time outdoors. Most SkyScan products are known for their easy use. Their detectors do not contain complicated menus, mainly because of the patented software used in all the SkyScan detectors. Therefore, SkyScan lightning detectors are usually an exquisite choice for individuals as well as professionals. Another world-renowned lightning detector brand is StrikeAlert, a popular choice amongst campers, hikers, and other people who spend a lot of time outdoors. The StrikeAlert brand is a part of Outdoor Technologies, the brand behind the StrikeAlert lightning detection system. To create the StrikeAlert system, Outdoor Technologies combined their Hewlett Packard experience with their measurement design experience; this eventually led to many StrikeAlert lightning detectors. The company updates its original technology over time too; this ensures that every consumer gets the best lightning detector possible. The AcuRite 02020 Portable Lightning Detector provides consumers with alerts for cloud-to-ground, cloud-to-cloud, and intra-cloud lightning strikes; this with a range of 25 miles! When the AcuRite 02020 Portable Lightning Detector detects lightning, the device will play an audible alert, but also turn on the flashing red LED light and display a message on the display screen. Most display screens of portable lightning detect limit themselves to displaying a message that lightning has been detected. However, the AcuRite 0202 Portable Lightning Detector takes it one step further, displaying additional information such as the number of detected lightning strikes and estimated storm distance. The AcuRite 02020 Portable Lightning Detector is easy to carry around too, since it has a compact design. However, the device has more features than that, since this device is also weather resistant! Considering that the AcuRite 02020 Portable Lightning Detector is used outdoors, it is certainly an essential feature. As one of the most reliable personal lightning detectors, the Xtreme Research SkyScan Lightning and Storm Detector is packed with useful feature. It also has robust design, making it less likely that the device will show signs of premature wear and tear. The Xtreme Research SkyScan Lightning and Storm Detector is powered by two batteries of nine volts. Most retailers will not include the batteries with this device, so consumers often must acquire the batteries separately. Tests have shown that the two 9-volt batteries provide 40-70 hours of operation. However, the Xtreme Research SkyScan Lightning and Storm Detector will also attempt to save its batteries after it is used continuously for a period of five hours; this by automatically shutting down the device. This could be an advantage or disadvantage, depending on the weather conditions at that time. To ensure a durable casing for the Xtreme Research SkyScan Lightning and Storm Detector, the manufacturer chose a durable ABS plastic for this device. The plastic ensures the device is not too heavy, but also provides extra durability to the casing. When the Xtreme Research SkyScan Lightning and Storm Detector is used, the consumer can detect lightning and thunderstorms with the greatest accuracy, since consumers can detect storms within 40 miles of their location. When a thunderstorm or lightning is detected, the device will play a continuous tone for fifteen seconds. Tests have shown that the Xtreme Research SkyScan Lightning and Storm Detector is accurate up to 1 to 2 miles for approximately 97%. However, this data does not include the false alerts that could be caused by slamming a car door. Users can configure the alert and set it to silent. When the alert is put on silent, the device will flicker a red light instead. The overall construction of the StrikeAlert II Personal Lightning Detector could be a little more durable. Therefore, caution is advised when using this device and while carrying it around. Battery life is somewhat shorter than most personal lightning detectors available today. If affordability and functionality are the features you treasure most for your lightning detector, then the StrikeAlert II Personal Lightning Detector might be the best choice for you. The affordable lightning detector can provide you with early warnings of lightning strikes that are as far as 40 miles, ensuring you can get yourself to safety. When the StrikeAlert II Personal Lightning Detector detects a lightning strike near your location, it will turn on the corresponding LED light. There will also be an audible alarm, ensuring you are aware of the incoming lightning. To ensure that the StrikeAlert II Personal Lightning Detector is easy to carry around, the detector is put in a pager-like casing; this casing can be put on the loop of your belt or your backpack. However, caution is advised when wearing the StrikeAlert II Personal Lightning Detector, since the casing is not as durable as some of the other options out there. The battery life of the StrikeAlert II Personal Lightning Detector is somewhat lacking compared to some of the other lightning detector. Even though the manufacturer claims that the device has up to 100 hours of reliable operation with two AAA batteries, tests have shown that this consumption is not accurate. However, the device still provides users with plenty of battery life during their activities or work. Still, having some spare batteries on hand might not be a bad idea. 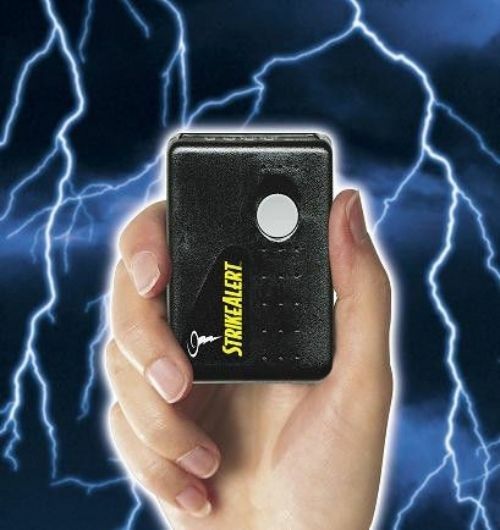 A StrikeAlert II Personal Lightning detector is easy to use too. With a single press of a button, consumers can determine the distance of the lightning strike, but also the direction of the storm and the remaining battery life of the device. We must mention that the manufacturer of this device stated that the StrikeAlert II Personal Lightning Detector should be used in an upright position. When the device is laying down, or on its side, the accuracy of the device may become affected. Still, this is the case for many portable lightning detectors available today. Consumers who choose the StrikeAlert II Personal Lightning Detector will receive a standard warranty of one year; this is the average warranty time for most personal lightning detectors. Still, having such a warranty protects you against problems such as material defects and poor workmanship. There are countless portable personal lightning detectors available nowadays, but only a select few can provide you with the accuracy and functionality you require. Many good personal lightning detectors are quite affordable though, so you should have no problems finding one to match your needs. When selecting your personal lightning detector, there are some things to take into consideration. Here are some of the main features you must review and consider carefully before buying your detector. One of the most important things of your detector will be the battery life, since you must rely on a functional safety gadget during your outdoor activities. Always search for a personal lightning detector with a lengthy battery life, and avoid detectors that do not provide you with an instant power solution such as batteries (or an alternative disposable power source). Storms can move quickly, so being able to detect them from a range is essential to keeping yourself safe in the outdoors. If you are searching for a good portable lightning detector, please make sure it has a range of at least 40 miles; this provides you with adequate warning of an incoming thunderstorm. A personal lightning detector should also be portable, especially for professionals who need this device for their daily operations. Ideally, you want a device you can attach to your clothing or your belt. Your personal lightning detector should also have an audible alert, since consumers may not always notice a red light going off while doing their daily activities. If you have an audible alert, you will hear the warning, even when you are busy. The last thing to consider is your budget, but it should never be the main deciding factor for your equipment. When it comes to your safety, you must be willing to make somewhat of an investment. Still, most personal lightning detectors are quite affordable these days.